Does your organization invest a huge amount of time, energy and money in training employees? If yes, there is now a better way to manage such training. Smart computer programs can take all the loads off your shoulders. Chatbots are one such artificial intelligence that can minimize your business efforts and help you graduate to better customer engagement, more effective employee training, greater productivity, and increased bottom line. 15% of consumers have used chatbots to communicate with businesses in the previous one year. The most common uses of chatbots among consumers included getting quick answers to urgent questions (37%), resolving a complaint or problem (35%), and getting detailed answers or explanations (35%). This demonstrates that AI-powered programs such as chatbots are gradually transforming the business landscape everywhere by simulating human beings. They streamline the process of engaging customers, besides cutting down business costs and activities drastically. Continuing the discussion, let’s take a look at the seven amazing ways chatbots can assist your business in producing extraordinary results. One major advantage of using chatbots is automation of mundane tasks such as answering frequently asked questions (FAQs) repetitively for different customers. For instance, text-based or voice-activated chatbots offer a seamless experience to users. Chatbots are designed to perform multiple tasks simultaneously and free of errors, which humans usually find difficult to do. In other words, they can free up the valuable time of your employees, ease their workload and energy, and allow them to devote themselves to core business activities for growth and success. A data-driven chatbot can generate a mountain of data and make them more readily available for analysis than other methods. This way, you can identify any problem areas within your organization and take corrective measures accordingly. Chatbots also provide feedback based on their interactions with corporate trainees. This way, they play a complementary role in employee training software, which is gaining acceptance among countless enterprises today as a necessary tool for online training, learning, and development of workforces. Another major advantage of using an enterprise software such as chatbot is that it enables a business to migrate all its employee training sessions online. Once you onboarded new employees, you need to train them to bring them up to speed. This is where chatbots assume significance. They can deliver advanced training to new joinees regarding your products, services, as well as company policies just like a human trainer would, and facilitate a smooth transition to the new work environment. Chatbots exhibit the intelligence to comprehend and process natural languages, thanks to AI and Natural Language Processing (NLP). Their multi-language support comes handy while using them in different regions marked by different languages. Chatbots are also intelligent enough to understand the context of a conversation, and identify the purpose of customers’ queries, thereby allowing employees to provide the most appropriate responses. Giving personal attention to each and every employee may not be feasible at times, especially in large organizations. Apart from the high costs that accompany such a proposition, it would require logistics on a mammoth scale. 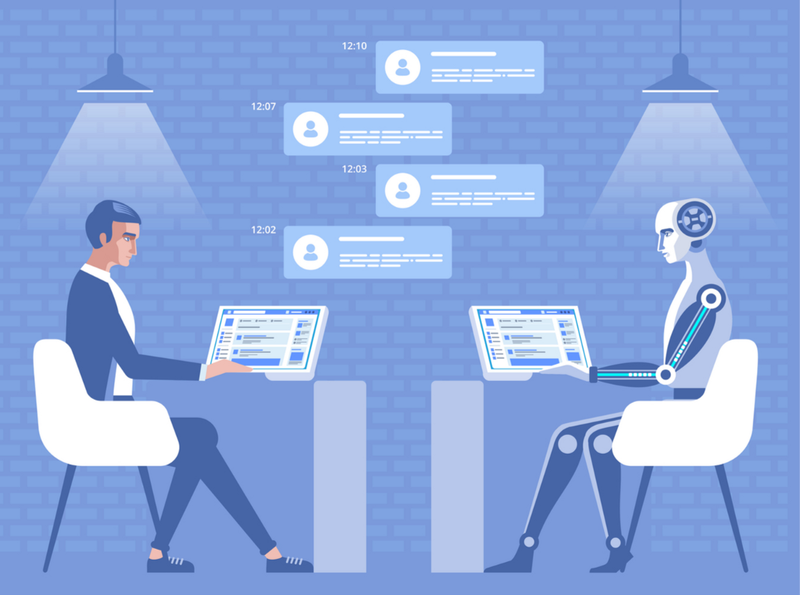 That’s where an interactive technology such as chatbot can serve as a reliable personal assistant to handle a variety of tasks normally performed by human assistants. Unlike humans, these types of software don’t feel tired, they don’t need breaks, and they don’t sleep at all. Their services are available 24×7. They can schedule meetings, send reminders, set up emails, book tickets, and so on. One of the greatest advantages of integrating chatbots in the workplace is their capability to carry on engaging conversations as humans do. The flow of their conversations is simple, seamless, and mature. You can use them in diverse enterprise systems and situations, thanks to their compatibility feature. As one of the most advanced conversational agents with highly interactive user interfaces (UIs), chatbots leverage the power of machine learning to aid in regular business transactions. They are one way to offload, for instance, recurrent chatting tasks earlier performed by human beings. Continuous learning and development form a critical part of every successful employee management process. Using chatbots, business leaders can incorporate learning systems in the workflow, and make interactions with employees more engaging and enjoyable. On top of that, learners can now access information and have answers to questions at their fingertips. When you make the learning process of your employees easy and a fun, performance and productivity are bound to increase naturally. It is clear from the discussion that chatbots offer a valuable means to streamline a business process. You can leverage them to execute your day-to-day duties in a simpler, faster, and more effective manner. Business leaders and managers are already bullish about the potential benefits of chatbots in making a difference in many industry verticals. Proper utilization of chatbots for the right purpose can eventually translate into greater business efficiency and productivity. If you are yet to deploy chatbots in your workplace, it is the right time to go ahead and do so. You’ll be glad you did. 7 Ways Chatbots Can Increase Business Efficiency and Productivity was originally published in Chatbots Magazine on Medium, where people are continuing the conversation by highlighting and responding to this story.